This is the essential Music Together® class, one that a child can attend from birth through age five and experience all nine song collections. This basic class follows the recommendations of child development researchers, grouping children of a variety of ages because this fosters natural, family-style learning. Younger children enjoy watching and imitating older ones; older children learn by leading younger ones; and adults are happy because the children in the family can go to class together. Each child participates at his or her own level in singing, moving, chanting, listening, watching, or exploring musical instruments. Any caregiver—parents, grandparents, nanny—can bring the children. The whole family is welcome for this important family music experience. "The children who have taken Music Together classes, consistently in the earlier years have all the basics in place for readiness for piano lessons, and have a huge advantage over children who haven't mastered being able to sing in tune, or keep a beat yet which they tend to spend many of their first or second semseter in an instrument lesson trying to get familiar with" (Kristen Manning, Piano teacher). 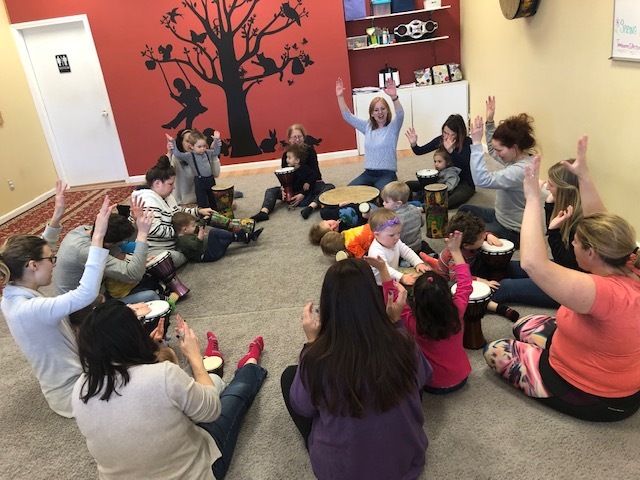 In our Music Together® Babies class, grownups will get to enjoy a group of other newborns with their caregivers making music together, learning beautiful songs & movements to sing to their babies in class and at home enjoying music all week long. They create a special bond in our classes with their baby and with all the other families in our classes. We sing, dance and play with instruments such as eggs, scarves, jingle bells, parachutes, sticks and resonator bells. Each family will receive a CD and a beautifully illustrated accompanying music book, as well as access to a website for more music activities and digital copies of the music. 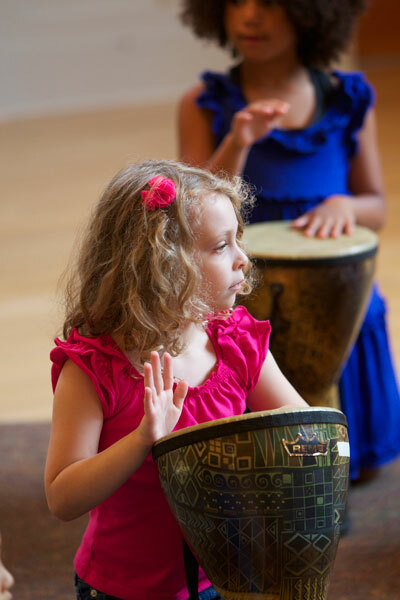 Like our Music Together® Mixed-Age classes, Canta y Baila Conmigo® classes are for children from birth through age 5, along with their grownups. Also like Mixed-Age classes, they’re informal and fun, and all families receive a beautiful, professional recording and illustrated songbook. In addition to the Spanish songbook, you’ll get an English language supplement that includes song translations, vocabulary, and grammar tips for those who are learning the language. 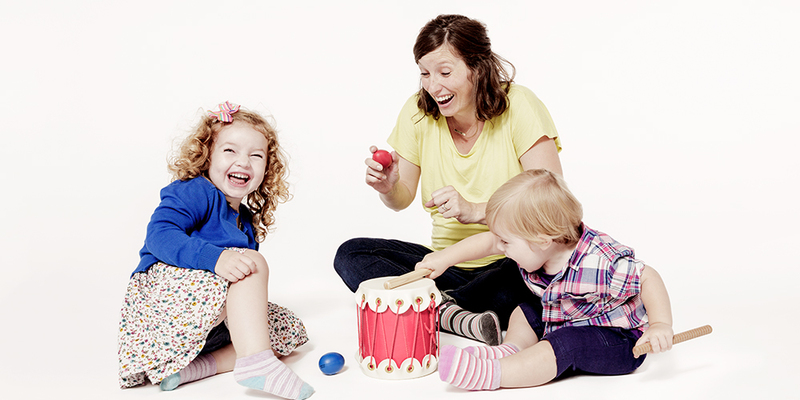 Rhythm Kids ®, Level 1 is a wonderful and exciting new class added to the Musical Folk curriculum. It is bursting with fun and playful eduction and will bridge the gap for children from our Mixed-age classes to get them ready for formalized instrument lessons when they are a little older. Some children start instruments around 6 years old. This class is geared for children 4 to 6 years old. Each week we drum, sing, dance, play rhythm instruments, and begin to play music-based games. 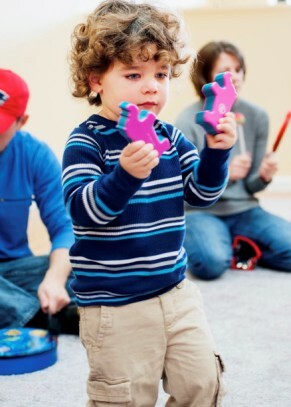 Rhythm Kids ®, Level 1 guides children toward developmentally appropriate music and movement activities, where they can begin to take charge, lead others, and be musically creative. 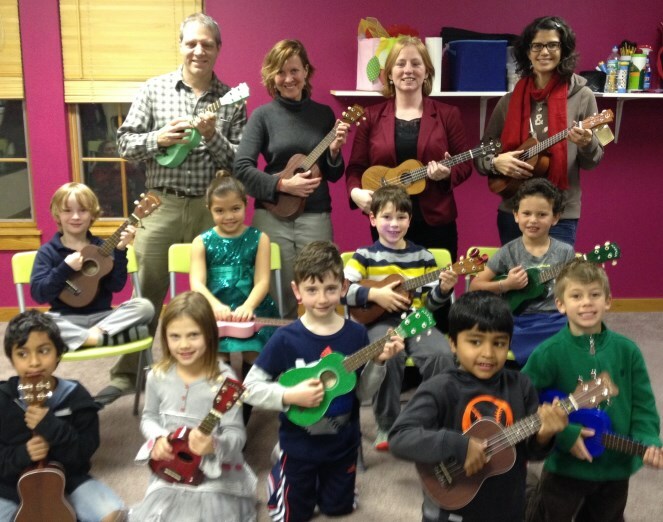 Our Ukulele lessons are fun and such an easy instrument to learn. It is perfect for children who love to sing and want to accompany themselves on an instrument. Within our first lesson we will have your child playing chords and singing along to songs. Each week we build on adding new chords and adding to their repetoire of fun, well-known folk songs. At the end of the semester, we hold a concert for family and friends, which is a wonderful opportunity for them to show off the skills learned in class and a great way to build confidence for singing in public. Liz McNicholl currently teaches adult group guitar lessons at the intermediate level. Students should be able to play a few basic chords to take these classes. Group classes are held on Thursdays at 1:00 pm. Private lessons may also be scheduled based on availability. These fun, interactive concert-style events are open to everyone. They will take place in the mornings and afternoons throughout the summer to best fit in everyone's busy schedules. In these concerts, everyone will have a chance to do some drumming, egg shaking, scarf waving and singing. Some of our teachers will be performing these interactive concerts in our Woodbridge and Cheshire locations. Registration is available for each individual Jamboree or you can join us for all of them - you get to choose. NOTE: we will resume with our Music Together Program in the fall. Our Summer Drum & Sing Jamboree will cator to "larger groups so you can invite your friends and will be more of a concert setting (Similar to our Holiday Singalong concerts) and cator to a fun large interactive group.